Pope Francis recently spoke on the rights of the poor and the need for environmental protection, saying he’s not preaching communism but the Gospel. Francis’ remarks to the World Meeting of Popular Movements, delivered in his native Spanish, ran for more than six pages, single-spaced. It was one of the longest speeches of his pontificate and a clear sign that the issues are particularly close to his heart. “They don’t understand that love for the poor is at the center of the Gospel,” he said. “Demanding this isn’t unusual, it’s the social doctrine of the church.” He promised that the concerns of the poor would be highlighted in his upcoming encyclical on ecology and the environment. This doesn’t come as a surprise. 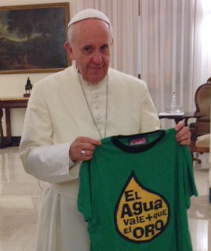 When Pope Francis met with an EJOLT representative last year and held up two T-shirts, one against large scale gold mining and one against fracking, he knew what he was doing. As archbishop of Buenos Aires, then-Cardinal Jorge Mario Bergoglio was also particularly close to the cartoneros, who sift through garbage looking for recyclable goods. As pope he has maintained his support for their plight and in general one might say he’s now the world’s most influential advocate of the environmentalism of the poor described by EJOLT coordinator Joan-Martinez Alier in his 2002 book with the same title.